This unit was shipped ready to install. The FilterSorb scale prevention medium was loaded in the tank before shipping. Just remove the unit from the box and connect it to your plumbing. There is only a small amount of FilterSorb medium in the bottom of the tank — as little as three liters, depending on the size of the unit. The tank will feel light, like it's almost empty. The FilterSorb scale preventer goes last or near last in most treatment systems. If you have filters for sediment, hardness, iron, hydrogen sulfide, manganese, etc., the FilterSorb unit goes after them. One exception is ultraviolet. If you have an ultraviolet system, the FilterSorb precedes it and will protect it from scale build up. The unit must be protected from the intrusion of dirt, sand, or rust. Always provide a sediment filter upstream. On city water, it is best (but not required) to pre-filter with carbon to remove chlorine. Chlorine or chloramine shorten the life of the media. FilterSorb media can be damaged by some water contaminants. Hardness 75 grains per gallon (gpg). See below. 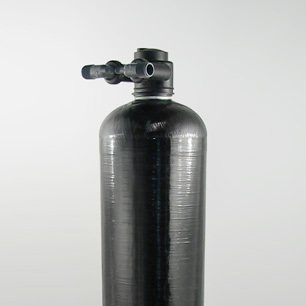 "Residential" FilterSorb units are sized for treating water of up to 25 grains per gallon hardness. "Heavy Duty" units are sized for 25 to 50 grains of hardness. FilterSorb is a scale preventer. Unlike a salt-based water softener, this product does not remove the hardness minerals, calcium and magnesium. It conditions them so they will not form hard scale in pipes and on fixtures, but you may still have to wipe away some mineral buildup. FilterSorb will loosen and clean out previous scale buildup, releasing it into the water stream. Things may seem a bit worse before they get better; you may get some soft scale formations on metal surfaces and in faucet aerators from old deposits breaking down. This is a simple "In/Out" installation. It does not require connection to a drain or to an electrical source. The water goes in through the port marked "Upflow Inlet" and exits to your service line through the "Downflow Inlet" port. This is important. The water must enter through the port on the right, marked Upflow Inlet. The unit can be installed directly to the 1" male PVC connectors provided, with or without the optional bypass. This is an upflow filter. Viewed from this angle, water enters on the right side. If your unit has a bypass valve, refer to the directional arrows. If no bypass is used, the inlet is through the port on the right, marked "Upflow Inlet" on the filter head. After the unit is installed, turn on water part way and allow the tank to fill slowly. 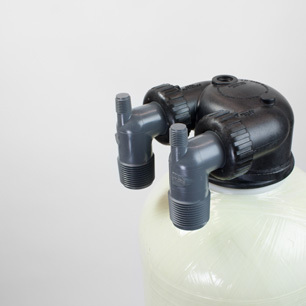 When the tank is full, turn off the water at the source (or use the bypass valve,if your unit has one, to isolate the FilterSorb tank), and allow water to stand in the tank for at least an hour to soak the FilterSorb medium. Then, turn on the water and put the unit in service. Media should be replaced as needed. Five years is the usual estimate, but this can vary according to water conditions. Extreme conditions of any kind, including extra long service runs, can shorten the life of the medium, as can adverse water conditions. See Recommended Water Conditions and Pretreatment. Our warranty on the treatment tank is ten years and on the head/bypass assembly five years. There is no warranty on the longevity or on the effectiveness of the FilterSorb medium. A five-year media life expectancy is an estimate based on ideal conditions, and not a guarantee of performance. Objective measurement of the unit's scale prevention performance is not possible, and we cannot make guarantees toward customer satisfaction. For problems or questions with the installation or performance of the unit, please call.